The idea for this soup came to me while we were harvesting our first large harvest of zucchini this season. I know soup can be a hard sell during the hot summer months but trust me on this one. This is a wonderful soup to serve with a fresh salad and can be enjoyed even on the hottest of summer days. 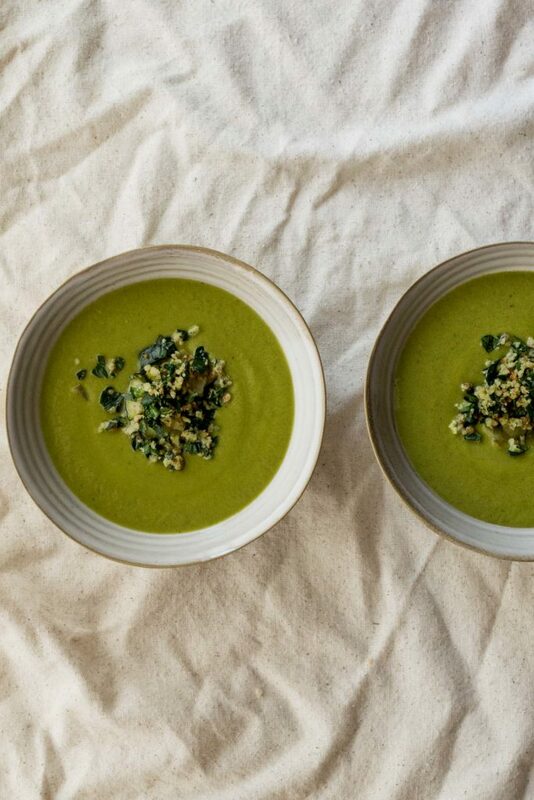 The almond gremolata is refreshing and adds a lovely crunch to this smooth soup. It would also be a great addition to other soups, pasta dishes or even garnished on top of salads or avocado toast. Seriously, the gremolata is going to be your new best friend! If you’ve been reading this blog for a while you already know how much I love the spice mix za’atar. It’s a delicious blend of thyme, sesame seeds, sumac, salt (and sometimes oregano and marjoram.) You can easily make your own by following one of my favorite recipes here. But nowadays the spice mix is available in many well stocked grocery stores and local spice shops. You can even order it online from amazon. I’m a firm believer that za’atar should live on the spice rack of every home cooks kitchens. You’ll find so many uses for it! This soup was a “recipe suggestion” for our CSA members this week. They’re all receiving zucchini these days and I don’t want them to get bored or overwhelmed with the harvest (that is only beginning…) Zucchini season is long but I want us to all enjoy it for what it has to offer. Between sweet and savory dishes this member of the Cucurbitaceae family is one to celebrate while it’s available. I hope you all get as much joy and pleasure spooning up this soup as we did. Toast up a baguette of bread, pour some wine and dig in! Prepare the gremolata by pulsing together the almonds, garlic, and lemon zest in a small food processor. Add the parsley, lemon juice and salt and continue to pulse until the mixture is roughly chopped. Taste for seasonings and set aside. Bring the vegetable stock to a simmer on the stove. Heat the oil in in a heavy bottom pan and cook the onion over medium heat until soft and fragrant, about 5 minutes. Stir in the zucchini and za'atar and cook for about 3 minutes longer. Add the hot stock and a hefty pinch of salt and bring to a boil. Reduce the heat to a simmer. Cook gently until the zucchini are cooked but not too soft, about 3-5 minutes. With a slotted spoon remove about half of the zucchini and place them in a bowl. Transfer the rest of the soup to a high speed blender and blend on high until completely smooth and creamy. Divide the remaining zucchini cubes between bowls in a pyramid shape, then gently ladle in the blended soup. Top with the gremolata and enjoy. Zucchini is one of my favourite veggies, and I can’t believe I’ve never had it in a soup or stew before. This sounds wonderful! Love the vibrant green colour! I would definitely not use almond butter as this is intended to be a crumbly topping. I hope that’s helpful. So simple, yet so delicious! Thanks for this recipe, it was the perfect dish for my evening + using up my zucchini! Being pressed for time, I ended up using leftover swiss chard pesto (also your recipe, from a few posts back) instead of the almond gremolata. so happy you enjoyed the soup too! Glad the chard pesto stood in for the gremolata. Sounds fantastic!